When you’re ready to serve, place the green beans in a microwaveable bowl, sprinkle with a little water, cover with plastic, poke a few holes in the top and microwave at 100% for 90 seconds, until just tender. If using the sour prickly pear fruit, cut it into small pieces: Holding them with tongs or a towel, cut the ends off the prickly pears, make a slit down the side from end to end, then peel back the thick skin, revealing the nugget of fruit. Cut it in half and, with a small spoon, scoop out and discard the reddish seedpod in the center. Cut the light-colored flesh into ¼-inch pieces. Fish out the short ribs from the slow cooker. The meat will fall from the bones: discard the bones and tear the meat into bite-size pieces. If a lot of fat has rendered and collected on the top of the broth in the slow cooker, skim it off. 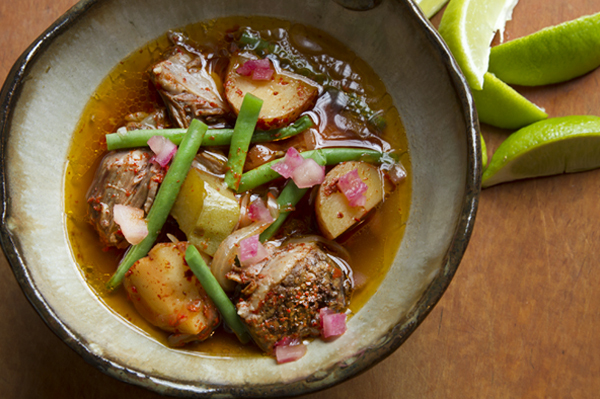 Stir the meat, green beans and optional xoconostle into the soup. Taste and season with salt (usually a generous teaspoon). No Slow Cooker? In a large (6- to 8-quart; at least 12-inches in diameter) heavy pot (preferably a Dutch oven) layer the ingredients as described. Bring to a gentle simmer over medium, set the cover in place and braise in a 300-degree oven 2 ½ to 3 hours, adding water occasionally if necessary to ensure the liquid stays at about the same level. Finish with the coarsely shredded meat, green beans and optional xoconostle as described in the recipe.